Showing results for tags 'leica cl'. Hi all, I am retiring in two months from my long career as a nuclear engineer, and treated myself to some quality equipment to reconnect to my old love of photography. I bought my first camera, a Minolta XGM after I graduated from college in 1982. Used the heck out of that thing, but ultimately replaced it with the Minolta Maxim 7000. I loved the whole auto focus and auto film advance, lol, and even started a weekend wedding business and developed the film myself. Shooting weddings ultimately paid for all my gear, yee ha! But then I had kids, and I set my cameras down except for family photos. Fast forward to the digital age and I picked up a Nikon D7000, 2010 I think it was, and really enjoyed the whole world of 16 mp digital pictures, but I never really got the bug again like I had in the 80s. But now, faced with the eternal question of what the heck should I do in retirement, I decided to come back to pictures. So, in the past three weeks I bought the CL kit bundle with the TL 18mm lens (27mm equivalent), the TL 35 (52mm) and the TL 60mm macro (90mm equivalent). I am done buying lenses, at least for this year! I have used the 18mm the most, think DC cherry blossoms, its just so handy. I got the 60mm macro last week and have enjoyed the macro mode shooting spring flowers and the like with it, also did some portraits of family members that came out nicely. Just today I got the 35mm from the Leica store here in DC. So have not used it yet other than a couple of test shots in the store to be sure it was working. Why did I buy Leica? I thought about a lot of cameras, and nearly pulled the trigger on the Fuji GFX system. But the more I thought about it, I really wanted a small system I could carry everywhere. Even with all 3 lenses and the body, my bag contents only weigh 4 pounds. And if I decide to just roll with the 18mm, then I don't even need a bag... that is amazing! I plan to travel extensively in my retirement, so I valued light weight and image quality above everything else. I wanted auto focus and a good lens selection to boot. I thought about all the major APSC cameras out there, for the smaller size benefits, and compared many review sites and user comments in various forums. I held all the cameras in consideration in my hands before I plunked down my cash. For me, in my situation, the CL was the winning camera. I didn't care it wasn't the newest. I didn't care it wasn't the cheapest (LOL). I didn't care that video was rudimentary. All I cared about were the aesthetics of the Lecia CL system and the images I saw being generated with the CL on this forum and others. I have had no buyers remorse, except for some troublesome thoughts that I may need a video oriented camera to supplement the CL at some point, but that is a worry for another day. Take care all. Has anyone used Auto-ISO enough to note whether the CL exhibits a stock preference to either shutter speed or ISO speed, or is it so damn smart it automagically knows which you would wish to be quicker? For example, when moving from indoor to strong sunlight and back again, setting at ISO max 6400, with a shutter minimum of 1/60s in AP mode you might expect sharp images with manageable noise all the time, but is it truly pot luck shot to shot which variable the camera changes to correct exposure? Is it true to say the function produces consistent results with only a "short range" set, if so what have you found to be acceptable? Three question marks in one post, sorry about that. Help! I changed the SD card in my CL. It felt a bit solid as I pushed, so tried to take it out again. No luck. It’s stuck. On the plus side, it is working. But that’s not really the point! Has this happened to anyone else? Easy solution possible? Hi, I'm interesting in new Ricoh GR III recently, and I just know that it has a so called "Snap Focus" mode, I wonder is there a way to let CL do that? I've tried setting the Right Wheel Button to Focus Mode and it's fine, but when I switched to AF and focus to shoot, then switched back to MF, I had to refocus the manual focus ring to the focus distance I was set. Is there a way to let CL remember my pre-setted focus distance when switch between AF and MF? Perhaps this topic had been addressed beforehand. I would like to know if these batteries can be used for CL: The battery is branded as DiviPower made by iCm Photography (China) - sold as compatible Panasonic DMW-BLC12PP rechargeable Lithium-Ion battery for Panasonic Lumix cameras. They are rated at 7.4V 2500mAh, higher than Leica's battery BP-DC12 rated at 7.2V 1200mAh. They are priced at 20% of the original. But I am not sure if the extra 0.2V will be OK for the CL circuitry? Thanks for your advice and thoughts. Benedict. 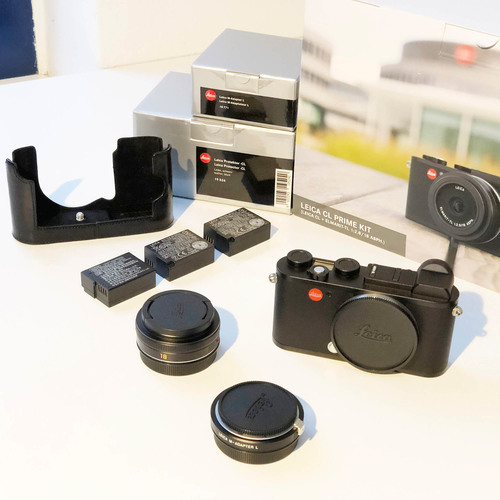 Leica CL Used CL or used M (262)? Hi All, My first post here, I've only been lurking since I don't have a Leica, yet. I've been contemplating a Leica, hoping to get some friendly advises whether a used CL is a good buy, or a used M 262, and a couple of prime lenses for them. A bit of background. My first real camera was a Yashica rangefinder with a 41mm lens, a gift from my aunt when I was going overseas to study. I shot thousands of slides with it, well, that was my only camera. Looking back, I like the 41mm focal length, and to this day, I still don't shoot at 50mm. I shot for a while with a Nikon D300 and the generic 18-200mm zoom while working and traveling in Europe and Asia, an 85mm for portraits, that's pretty much all I shoot, very little landscape or macro or anything else. Occasionally, I rent the Nikon 14-24mm to do some interior work. For wide,the 28mm is not satisfactory for me, I would go 21mm or wider. I moved to the D810 for full-frame and only own 2 lenses, 35mm/2 and 85mm/1.4. So I want to get something more compact and don't mind APS-C to travel with, a Japan trip is coming up. I seriously considered the Fuji x100F/T but crossed that out after trying a friend's X-E2, something about the Fuji tone that I do not get excited about. I considered the Nikon Df but it's not much smaller. Then I started reading this forum. The M10 is out of my budget, and wonder if the M 262 is still a good buy, I will probably look for a 40mm first before considering a 35mm/2. Along the way I considered and ruled out the Q, excellent as it is, don't mind a fixed-lens but I think I would not be happy at 28mm. Yes, I know you can crop to 35mm and 50mm, but it's not the same, if you get my drift., So the other thought is a used CL, APS-C is fine. I understand the CL goes well with the 23mm Summincron for 35mm equivalent, the Nokton 40mm sounds good, but that'll be 60mm equivalent. So would anyone suggest a 28mm to give me a 42mm crop? Sorry for the long-winded post. Thanks All. I am personally not there yet but I was wondering whether anyone is using the Leica CL as their only or main camera and what they were shooting before. Also, whether you are missing anything from your previous platform. Or the areas in which you feel the CL is still severely lacking. Didn't get much attention during photokina: The Leica CL has a new firmware update: » Leica CL Version 2.1 (Download) Details and installation instructions The improvements: NEW: Compatible with the new Leica FOTOS app Connect your smartphone to your Leica camera NEW: QR Code for all Leica Cameras Easy pairing of smartphone and Leica cameras. NEW: 1-Click Connection with FN-Button WLAN starts without submenus on FN-button. NEW: Fixed WLAN name and password No submenus for setting name and password. NEW: No submenus for mode settings No submenus for setting a connection mode. Leica CL - What is this faint black shadow line on top of my photos/negatives? Hi all, I have a problem with some of the photos from my Leica CL/Leitz Minolta CL (M-Rokkor-QF lens). About a third to half of the photos have this strange faint (and sometimes darker) black shadow. It's always in the same spot at the top of the photo and it also shows on the negatives/slides. Does anyone have any idea what could be causing this? Is this some sort of fogging maybe? Or a light leak? Thanks, Eran. Leica CL What profile to create? I just purchased a CL (coming from a Nikon 35mm film system) and am looking for a good starting point for setting up profiles. I've seen reference to Jono's recommendations but for the life of me cannot locate the actual settings. Any suggestions here? Can anyone tell me the actual aperture setting at the various focal lengths for the CL zooms? I know the setting at the widest and the longest focal length, of course, but what about in between? Thanks!